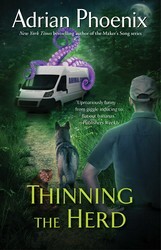 From the New York Times bestselling author of A Rush of Wings and The Maker's Song series, a humorous, action-packed urban fantasy about a werewolf pack and an animal control officer in way over his head! Someone is picking off fortune tellers and hippies in Oregon, snatching them out of their Birkenstocks mid-stride. And when the legend himself, Hal Rupert, Animal Control Officer, gets a whiff of the mystery, he knows he's the man to solve it.